In light of World Cancer Day yesterday, we decided to do our part to help bring awareness to one of the four key areas of the 2015 campaign: choosing healthy lives. According to the worldcancerday.org website, currently 8.2 million people die from cancer every year, out of which 4 million die prematurely (defined as aged 30-69). Choosing a healthy lifestyle is crucial to reducing our risk of being diagnosed with cancer and putting an end to it once and for all. 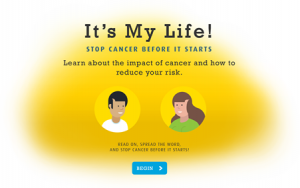 The Canadian Cancer Society has a fun interactive tool called It’s My Life! that educates people on the impact of cancer and how to reduce the risk. Click here to check it out. If you have been diagnosed with a critical illness like cancer and encountered issues with insurance claims, we can help so that you can focus on recovering.